In a very real sense, each of us has been given an invisible golden box filled with unconditional love and kisses from our children, family, friends and God. During this holiday season we hope you cherish all those who have given you their unconditional love. Happy holidays from all of us here at Family Investment Center! To read more inspiring short Christmas stories, click here. According to a Reuters article shared by CNBC.com earlier this week "Should You Superfund Your 529 College Savings Plan? ", college costs have reached an average of $40,917 a year for a private four-year college and $18,391 for a state school, as researched by the College Board. These high numbers along with ever-increasing tax rates have affluent families and wealthy grandparents considering strategically "superfunding" a 529 college savings plan as a way to aggressively cover college costs while also saving on taxes. If you are interested in finding out about the benefits of contributing to a 529 plan, click here to read the full article. With the start of a new year just around the corner, those with current financial burdens may be seeking advice on a fresh start. Luckily we found a helpful article published by O Magazine and written by internationally acclaimed personal financial expert Suze Orman titled "10 Tips for a Fresh Financial Start". Whether you are currently or soon-to-be in need of a financial clean slate, this article provides advice about how to get back on track. Listed below are the 10 tips provided in the article, but you can click here if you would like to read the article in its entirety. Click here if you would like to visit Suze Orman's website. 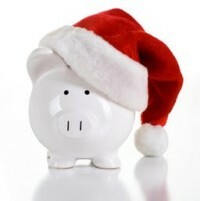 SmartAboutMoney (SAM) recently posted an enlightening article titled "Hidden Costs of the Holidays". The article outlines expenses for non-gift items that consumers tend to forget about when planning their holiday shopping budget, and also provides readers with "SAM's Smart Tip" to help save a little more on these purchases. Click here to read the full article. Also, click here for SmartAboutMoney's Holiday Season Checklist, which can help you budget correctly for this year's shopping season.